Sumatra is home to the Critically Endangered Sumatran Orangutan, as well as other iconic species such as Sumatran Tiger, Sumatran Rhino and Pygmy Elephant. Orangutan Land Trust would very much like to be part of any strong initiatives to secure and protect orangutan habitat within Sumatra. Sarawak has fewer orangutans than Sabah and Kalimantan, but with extensive historical deforestation, every last bit of orangutan habitat is crucial to their survival. 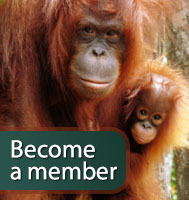 Orangutan Land Trust seeks partnerships to protect these remaining strongholds for orangutans and other wildlife.